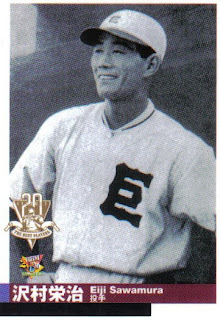 I missed this, but NPB Tracker didn't - Friday of last week (November 20) was the 75th Anniversary of Eiji Sawamura's one hit game against a group of touring All Stars - a game in which he struck out future Hall Of Famers Charlie Gehringer, Babe Ruth, Lou Gehrig and Jimmy Foxx in succession, although Gehrig got revenge later in the game by hitting a solo home run for the American's only hit and the winning run. Rob Fitts has the details here at his 1934 All American Asian Tour blog that he's using to promote his upcoming book on the tour. 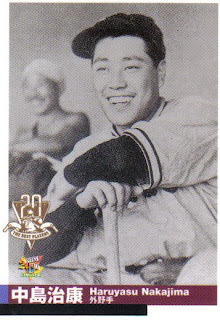 Due to several stints in the military, Sawamura's professional career only consisted of the 1936, 1937, 1940, 1941 and 1943 seasons before his troop ship was sunk by an American submarine in 1944. 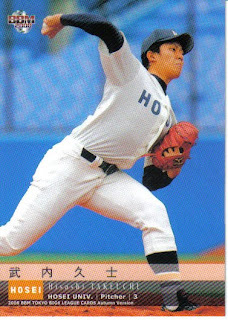 The Sawamura award for best pitcher in NPB was first awarded in 1947 and he was among the initial inductees into the Japanese Baseball Hall Of Fame in 1959. 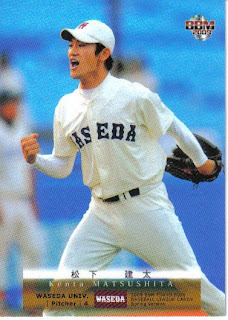 Some of the afore mentioned cards use the same picture, so there's more cards of Sawamura than actual pictures! Maybe it was just me, but it seemed that Akira Etoh's retirement didn't get a whole lot of press in the last days of the season. It could have been announced earlier and I just missed it. The Lions apparently gave him a send off at their fan fest yesterday. This also means that again BBM struck out with their "Rookie Of The Year Preview" subset in the 1st Version set - neither of the winners is in it. 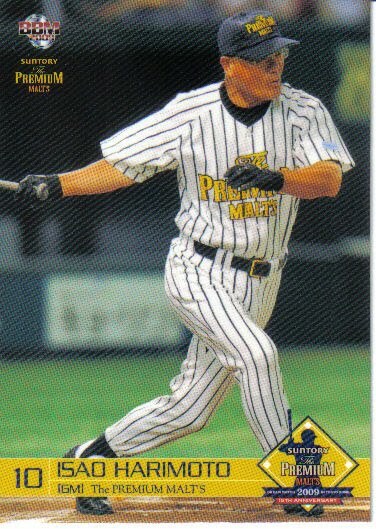 I also received the 2009 BBM Premium Malts set in the mail the other day. 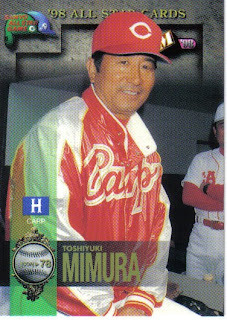 This set commemorates an old timer game that Suntory Brewery puts on every year. This year, the two teams were called "The Premium Malts" and "World Japan 2009". It's actually a pretty interesting group of players who were on the rosters, but not everyone who was on the roster appears in the set - I'm going to assume that the set only includes guys who actually appeared in the game, but I don't know that for sure. 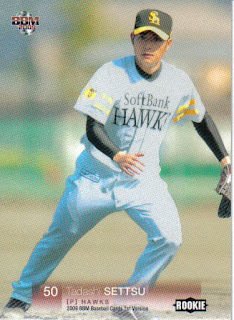 What I can say for sure is that Yutaka Enatsu, Choji Murata, Daiuske Motoki, Mitsuo Tatsukawa and Koichi Tabuchi appear on the rosters but not in the set. The set does include a wide variety of OB players including 77 year old Keiji Ohsawa, and 69 year olds Isao Harimoto and Eiji Bando, as well as a lot of guys who played a little more recently - Randy Bass, Osamu Higashio, Hiromichi Ishige, Hiroo Ishii, Tsutomu Itoh, Masayuki Kakefu, Masumi Kuwata, Hiromi Makihara, Yukihiro Nishizaki, Kenjiro Nomura, Yutaka Ohno, Akinobu Okada, Shigeki Sano, Shinji Sasaoka, Yukio Tanaka Yasushi Tao and both Koji Yamamoto's to name several of the more notable names. The set itself is a 51 card box set (plus an insert/autograph card - as usual I got an opened box without the extra card) with 26 cards for "The Premium Malts" and 25 cards for "World Japan 2009". The cards are OK - the pictures are nice, but I'm not real impressed with the design. 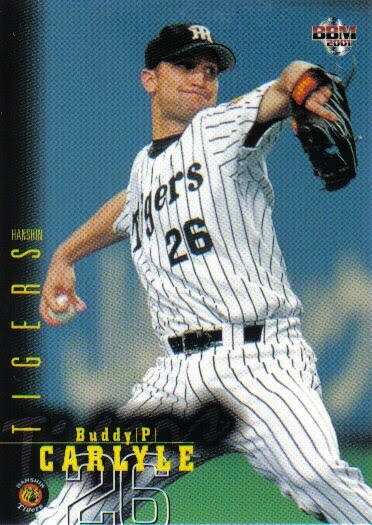 The design looks like some of the minor league card designs done in the late-90's. I don't know, maybe it's just I don't like the font. From the top, that's Yukio Tanaka (#43), Tsutomu Itoh (#38), Shinji Sasaoka (#24) and Isao Harimoto (#02). I'm hoping that if this set does well, BBM will consider doing a set for the Masters League. Got my 2009 BBM Tokyo Big Six Autumn Version set in the mail the other day. 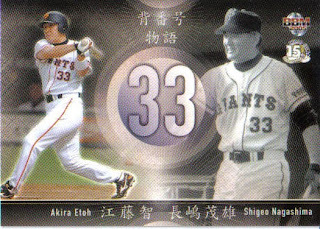 This is a 36 card box set (plus one insert card - more about that in a minute) that came out a couple of months ago in conjunction with the Tokyo Big Six's fall season. 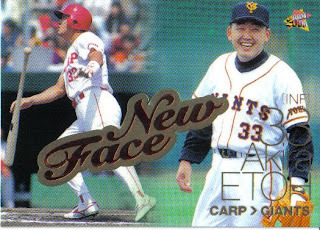 The set features five player cards for each team plus a team picture. 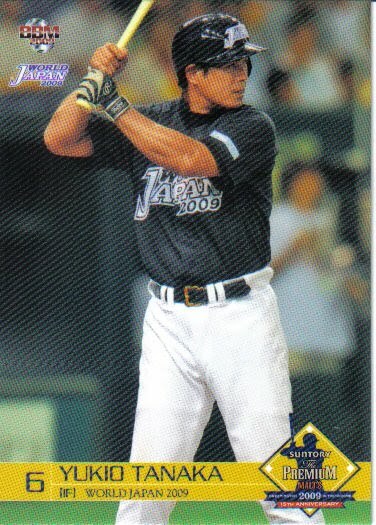 As Deanna mentioned here, the set contains one card of a player taken in October's NPB Player Draft (Rikkio's Kenji Tomura). 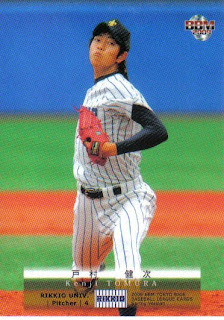 Deanna also mentions that the insert cards are the spring season's Best 9 and feature at least a couple of players who are not in the rest of the set (she mentions Hiroshi Taki and Shingo Kamegai - I'm trying to find the spring Best 9 list on line and failing...) As usual, the cards have a nice simple design with beautiful photography. 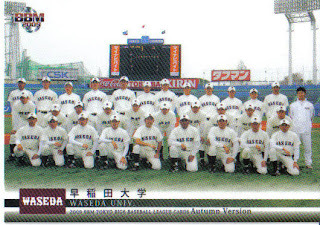 From the top, that's the Waseda team card (#12), Junpei Komuro (#19) and Soichiro Tanaka (#29). I was looking up some stuff the other day regarding the beginning of the two league system in Japan in 1950 when I was reminded of a rather obscure piece of trivia - the team that is now the Saitama Seibu Lions began life in 1950 as the Nishitetsu Clippers. Before the 1951 season, the Clippers merged with the Nishi-Nippon Pirates and the new team was christened the Nishitetsu Lions. 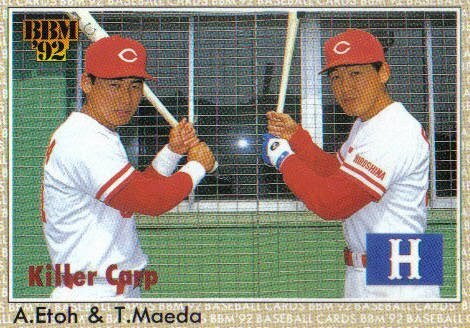 (I could be wrong here, but it looks like Nishi-Nippon Railroad actually owned both the Clippers and the Pirates - Nishitetsu IS Nishi-Nippon Railways.) Interestingly enough, the Pirates were a Central League team while the Clippers (like the Lions) were in the Pacific League. Today marks the second anniversary of my starting this blog. 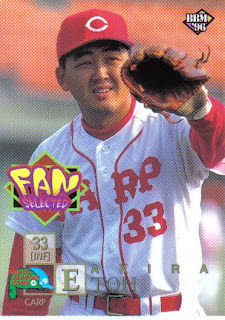 I think my second year went a little better than my first - this past year I didn't tell someone that his son DIDN'T have a card in the BBM 1st Version set when in fact he did and I didn't get confused about the first and last names of the Orix manager either. I think the worst mistake I made this year was forget that Kaz Tadano and Michael Nakamura had both pitched in the US before they pitched professionally in Japan. To all of you who read this, thanks for another year of fun. 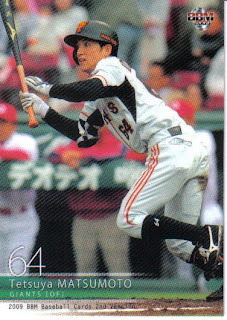 and Eiichi Koyano). 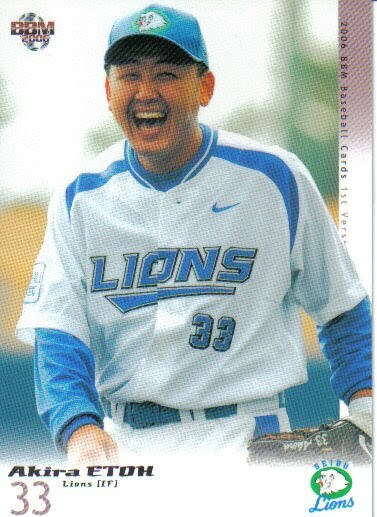 It does not appear that there will be a card commemorating George W Bush throwing out the first pitch in Game Three. Since I prefer to avoid politics with my baseball, I'm going to refrain from commenting on whether that's a good thing or not. The set will be out in December and will pretty much wrap up the 2009 issues for BBM. - The announcement of the Nippon Series set was no surprise. What was a surprise was the announcement of a Kintetsu Memorial set. 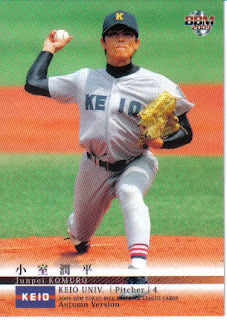 I think this set is meant to celebrate the 60th anniversary of Kintetsu's entry into professional baseball in 1950 with a team known as the Pearls. 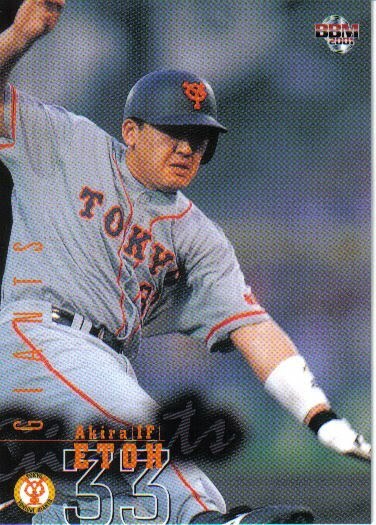 (BBM had done a Kintetsu Memorial box set back in late 2004 when Kintetsu merged with Orix.) It's a 99 card pack based set that pretty much follows the pattern of the recent team anniversary sets. 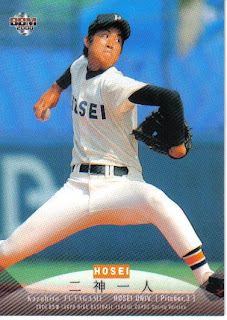 There's a six card "team history subset", 84 cards for former players (and obviously no current Kintetsu players) and a nine card "team record" subset. 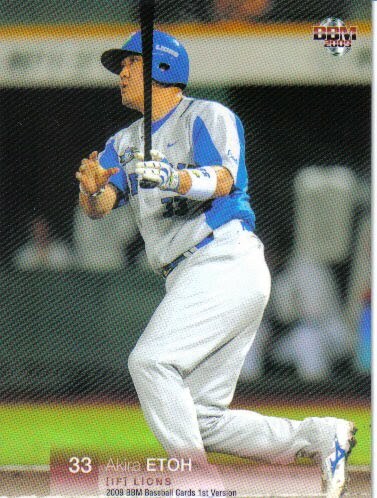 There's also the usual insert cards (Kintetsu Best 9), photo cards and autograph cards. 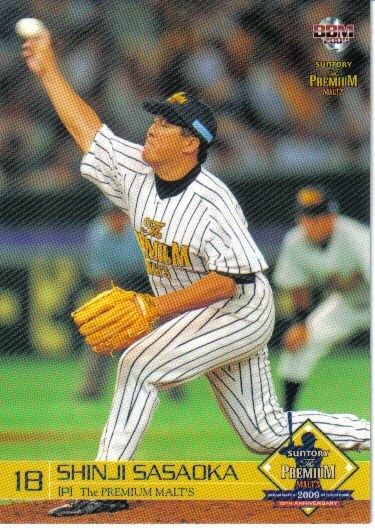 What are the chances that Hideo Nomo will appear with the OB players? 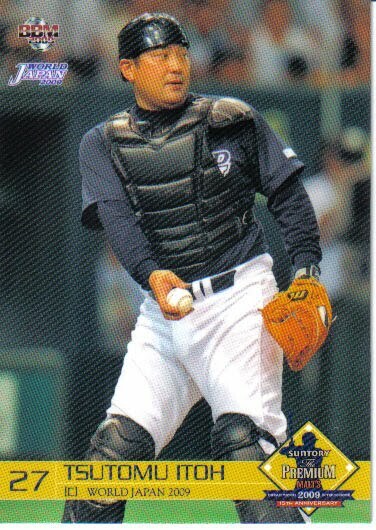 And I'd expect to see at least two Tuffy Rhodes cards in this set - as an OB player and as the team record holder for most home runs in a season (if not career). The set will be out in mid-December. - Prestige Collectibles' latest auction began this week and will run until November 19th. 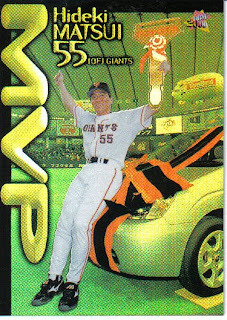 Lost in all the fuss about Hideki Matsui being the first Japanese player to win the World Series MVP is that fact that he is the first player to ever be the MVP in both the MLB World Series and the NPB Nippon Series, which he won in 2000 for the Giants. 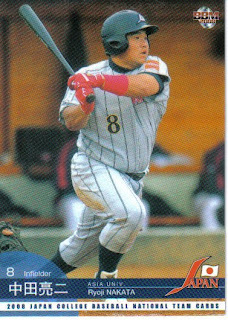 The card above commemorates that award in the 2000 BBM Nippon Series set (#S60). It was announced this week that Saitama Seibu Lions pitcher Hideaki Wakui won this year's Sawamura Award. Well, I've been expecting it all year and it got announced today on BBM's website: a set commemorating the 20th Anniversary of Orix buying the Hankyu Braves. 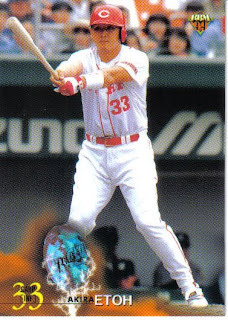 The team played as the Orix Braves in 1989 and 1990, then called themselves the Blue Wave from 1991 through 2004. Following the 2004 season, Orix merged with the Osaka Kintetsu Buffaloes - well, absorbed is probably a better word than merged as Orix remained and Kintetsu got out. The new team was the Orix Buffaloes. Instead of the usual 99 card pack-based sets that the other recent anniversary sets have been, this is a 55 card box set. There are 33 cards of former Orix players, 15 cards for current Orix players, a six card "Scenes" subset (showing important events in Orix history) and an insert card (which could potentially be an autograph or memorabilia card). The set should hit the stores in December. 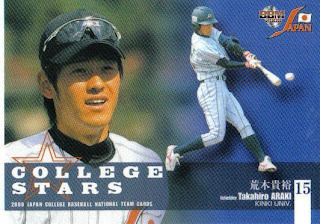 The 2010 NPB draft was held last week and it got a little more attention than normal due to one guy who was considering skipping NBP and heading straight to the majors. 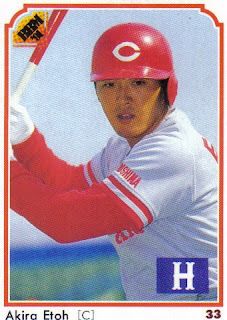 For the record - there currently are NO Yusei Kikuchi cards - if you see one on eBay, it's an "unlicensed collector's issue" (fake). 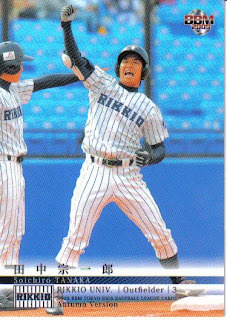 Kikuchi's first card will most likely be with the BBM's Rookie Edition that will come out next February. 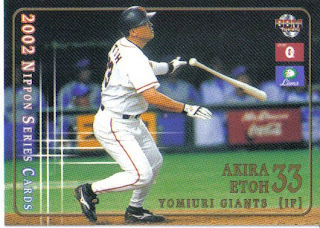 Deanna Rubin reports that Tomura is the only one of the drafted Tokyo Big Six players to appear in the 2009 Autumn Version set. 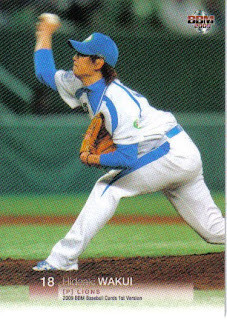 As usual, Deanna Rubin has all the information that you'd ever want to know about the draft and has a photo-post up already about the players that she's seen who were drafted by the Central League teams. 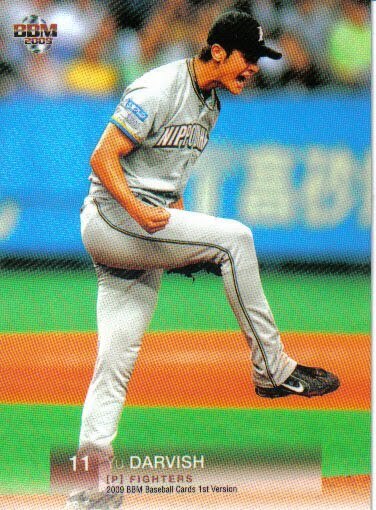 Nakajima was player-manager with the Giants and later went on to play and manage for the Whales. 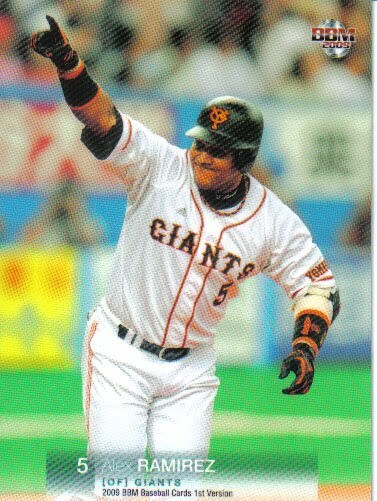 The only other manager of the Giants who played for another team was Hideo Fujimoto, who managed the team between Nakajima's stints. 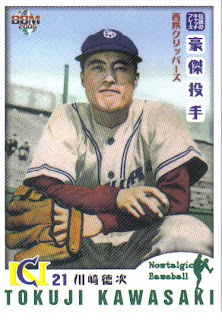 Fujimoto played one year for Chunichi in the late 1940's. Note that none of these guys played for a team other than the Giants BEFORE they were Giants manager, only after. There has never been a Giants manager who played for any professional team other than the Giants prior to becoming Giants manager. 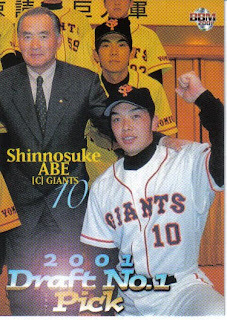 In fact, the only guy who has managed the Giants without playing for them was the Giant's first manager, Sadayoshi Fujimoto. 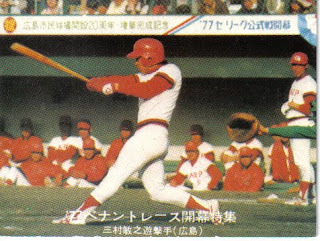 I'd like to thank Japan Baseball Daily, Jim Albright's list of Japanese managers by team and the Player Number History web site for all their help with this post.